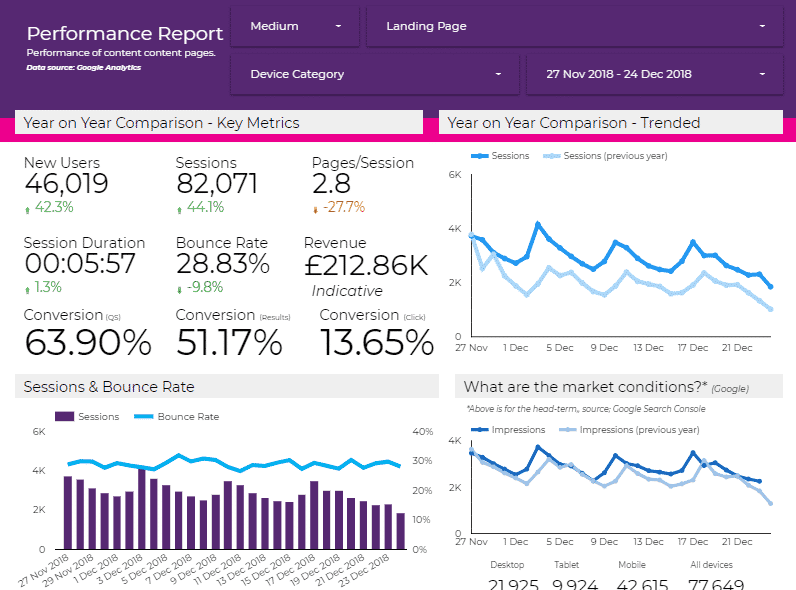 I thought I’d write up this post as I’ve received a few queries via email off the back of the Google Data Studio report I shared with everyone, as to how I’ve come about to creating Google Data Studio reports. In all honesty, I did not start with creating reports that everyone would like to use, but were useful for me to use and eased up my reporting schedule. I’ve basically developed off the back of actually finding the reports useful myself and what’s saved me loads of time. Of course, what saves me loads of time might not save others loads of time, but on the reverse, it may also be useful to loads of people. If there is anything to master in Google Data Studio, it’s designing a report that looks good and has a good user experience. I feel like design has been a key element in making reports that people will actually use, but obviously the underlying data needs to be trustworthy and accurate. I’ve created some nice looking reports and I’d say my Google Data Studio reports that look at actual trends look pretty good (not yet released this design), but you can get a good feel for design. 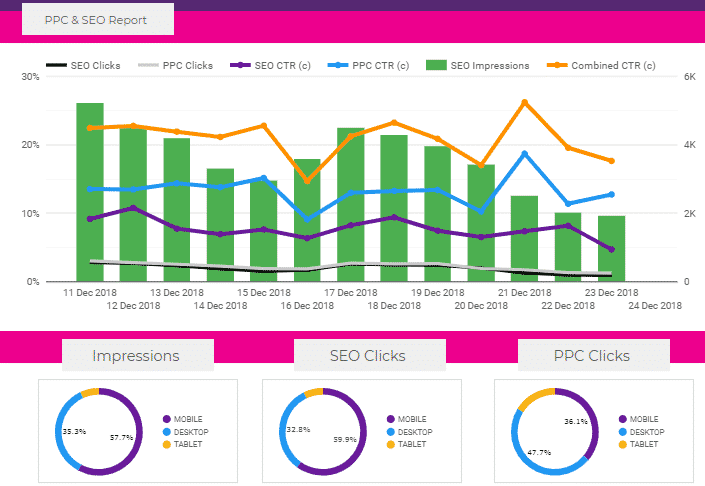 Lee Hurst, who I credit as being an expert with Google Data Studio, has created a directory of Google Data Studio reports, and his website, Helpfullee.com is full of information. 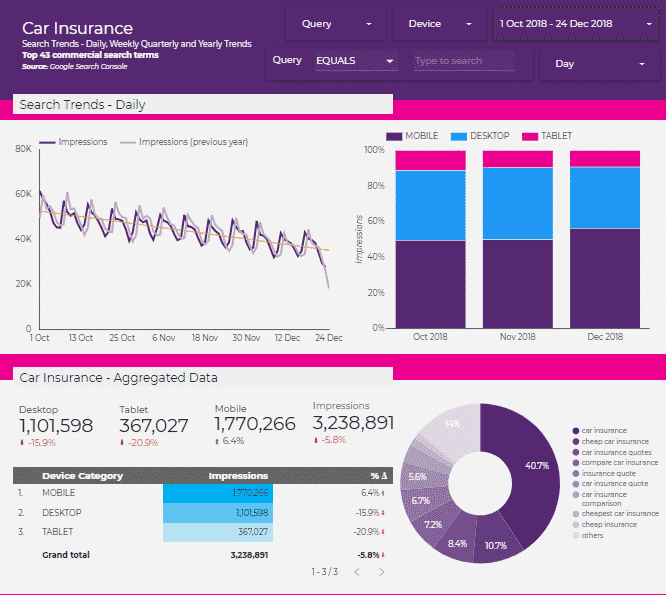 You’ll be able to get a good idea of how you should design your reports by looking at all the various options in the directory of existing reports. I’m also looking to create & share more templates that I’ve built personally, which I think look amazing (one for everyone to decide on though). Include enough features in your report that you’re not bloating your report and therefore your consumers with too much information. I do like to add a lot of things to these reports, so much so that you can identify the problem and also the solution to the problem — due to the amount of data contained within the report. But that’s a given and I’ve balanced that up with what’s relevant. I tend to add as many features as I can think of, then cut the fat at a later stage when I realise that not many people are using various aspects or when I think they don’t really add that much value. 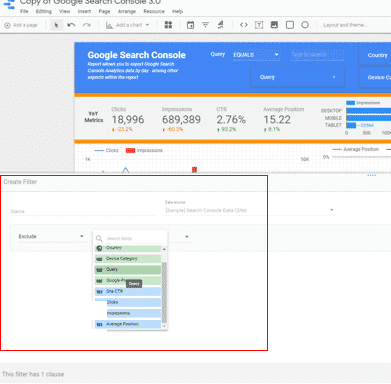 Filtering within Google Data Studio is key. I’ve used filtering to such an extent that I’ve written up a blog post on how you can go about filtering your reports within Google Data Studio. Pre-filtering reports allows you to create reports that don’t require much change upon load. If you, for example, create a report that filters to show only organic search traffic (assuming we’re talking about a Google Analytics Data Studio report), then the consumer of that report won’t have to change much if all they’re interested in is organic search traffic. It’s all about making things easier and more accessible in Google Data Studio, as you can easily replicate some of these reports in Google Analytics directly, so filtering effectively allows you to tailor your report to certain audiences — this is how I view and use filtering within Google Data Studio. I would also say that the dashboards look better, are easier to share, and more configurable (drag and drop) in Google Data Studio, so many, many benefits there. You can find more here about filtering in Google Data Studio. How, you might ask? You can visit Google’s official guide here on Calculated Fields. This basically will pick up all of the branded search queries that I know of. I’ll be creating a seperate tutorial on how I’ve done the above in due course. Perhaps in the new year or just before. The options with this are limitless, extensive and exhaustive. Blending data is super useful for a variety of reasons. I’m still waiting on the Google Data Studio team to fix a bug with Chart Specific Fields when blending data sources (54 people have starred this issue). Beside the point, the blending option is fantastic for marrying two data sources together. 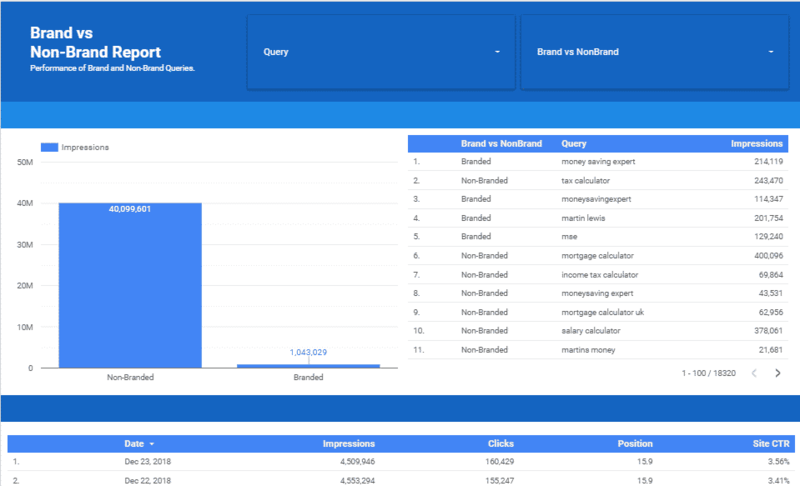 For example, I’ve managed to combine Google Ads and Google Search Console data together. I’ll be putting together a tutorial on how I’ve done this, but in terms of visualisation, you can create something quite remarkable. I’ve managed to get this to work on a search term, country, and device level. Admittedly, this part of Google Data Studio is still rather buggy. I’m hoping in 2019, the Google Data Studio team will repair and fix many of the bugs that exist, and in particular the bug with blending two data sources together.